Keeping the head elevated while sleeping is one of the best natural home remedies for Bags Under Eyes. To make this remdy effective, use one or two pillows beneath the head in order to avoid bagginess due to fluid retention. Applying a face mask prepared from parsley leaves provides a soothing effect and helps reduce Eye Bags naturally. Using fresh and cool cucumber or potato slices on the eyes is one of the simplest natural home remedies for Bags Under Eyes and Dark Circles. 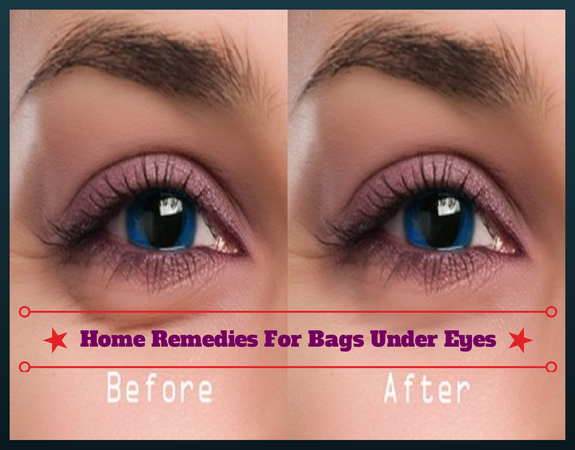 This home treatment should be followed on a regular basis to heal Eye Bags naturally at home. Regularly splash cold water on the face and eyes to improve circulation and avoid Bags Under eyes due to unnecessary fluid accumulation. Placing frozen tea bags on closed eyes for about 10-15 minutes is one of the most popular Bags Under Eyes home remedies by reducing the swelling in the area. Ice compresses can also be used to cure Under Eye Bags. Chamomile tea, black tea, green tea and sage broth are highly beneficial in the home treatment of Eye Bags. Mixing equal parts of rosewater and witch hazel and applying this mixture on the eyes for about 15 minutes is an effective home remedy to soothe the eyes and get rid of this problem. Placing a chilled metal spoon over the eyes also serves as natural remedy to reduce Bags Under Eyes. Certain facial exercises and eye massages help to tighten the eye muscles and improve circulation in the eye area thereby serving as an effective home remedies for Eye Bags prevention and cure.